The winners of the JAPAN PRIZE 2018, an international contest for educational media, were announced and awarded in Tokyo on November 9. In the TV Proposal Division, the Hoso Bunka Foundation Prize for the best proposal, selected from the 5 finalists out of 34 entries from 18 countries/regions, was awarded to “Life” presented by Vientos Culturales A.C., an NGO of Mexico. The winning proposal was to create a documentary focusing on a teenage boy who has a strong motivation to make a difference “through artistic activities” in his poor indigenous community in Southern Mexico, where a number of suicide attempts by youth has been increasing. 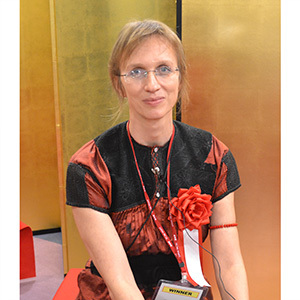 At the awards ceremony, Ms. Elke Franke, executive producer at the NGO that produces TV content focusing on marginalized children and youth, received the trophy from President of the Hoso Bunka Foundation, Dr. Yasuharu Suematsu. After the ceremony, when asked why her team decided to make this documentary, Ms. Franke said, “Knowing a shocking fact that all the people we have interviewed in the indigenous community have a close experience with suicide, and that the suicide issue is hidden from the public, we seriously started thinking about what we could do to change the situation”. According to the NGO’s research, one of the major factors for suicide is the “huge gap of communications between generations” created by accelerated modernization. “It provokes an identity crisis among those young people. In addition, they have to face other problems such as discriminations against indigenous communities and lack of opportunities,” said Ms. Franke. So meeting the positive and passionate young man Erik who is trying to show people the greatness of life by promoting art, she came up with an idea to make a documentary on his activities. “Art is a great tool for young people to express and communicate emotions and recover identity,” said she, adding, “Erik is a protagonist of the story, but the life is also a protagonist, and the antagonist would be suicide”. 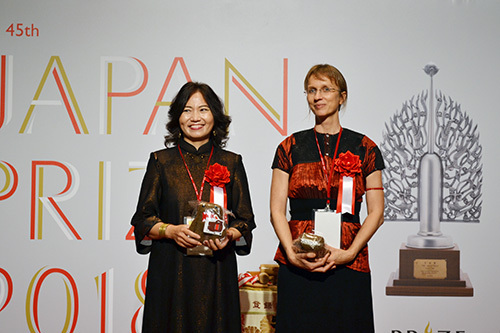 During the Japan Prize week from November 2 through 9, the five finalists that had passed the preliminary selection were required to go through a workshop in Tokyo organized by the JAPAN PRIZE and learn how to make an effective presentation of their proposals before making a final pitch to the jury that would decide the winner. During the final selection session, Mr. Sein Lyan Tun (Myanmar), the winner of the 2017 Hoso Bunka Foundation Prize screened his team’s finished documentary, “A Letter to Jejara”. Q) What made you think about producing this program? A）We produce a newscast for children in Mexico, and we heard there are a number of suicide attempts in an indigenous area. So last year, we went to the community of San Andrés Larráinzar (Chiapas state in southern Mexico) to report on the issue. We visited a local school there and interviewed 3 young people and learned a shocking fact that all of them had a close experience with suicide. One of them was very close to a suicide attempt, a second one has tried to kill himself, and a third one, that was Erik, the major character of this documentary, lost his best friend to suicide. We also interviewed a young man named Alfredo who had had an experience of attempting suicide but had been treated on time. He was a rap singer, so he sang for us about how he felt what had led him to do so. We shot his performance, then 2 or 3 months later, we heard he had been killed by a drugged young man. So all things together made us think about what we could do to change the situation. There are a lot of researches and investigations about the problems of children and youth going on in Mexico, but there are not many actions to change the situation. So we seriously started thinking about it. This project involves not only the municipality and media, but also the activities of a young boy, Erik who has a motivation to make changes in his village. I thought it would be a good idea to propose it as a project to Japan Prize, and fortunately it was elected. So we’ve had an opportunity to present and talk about the issues and to put it on the table because it’s very much hidden in Mexico. Q) How did you meet Erik? A) Our producer was born in San Andrés Larráinzar, so he has a relationship with the population there. But we came to know each other during the interviews for our news report, then we kept talking with each other on Skype. Q) How are you going to produce the program? A) A documentary is about real life, but when you take a camera out, something like Japan Prize has also an influence. So I think Erik has a lot more motivation now. The idea is to start in January, and in April, we will have a village fair where he wants to make intervention. The idea of producing is to have, first of all, the “testimonials and facts”. So we will interview people who are related to the issue of suicide and will have them in the documentary. Then we’ll follow all the art proposal of Erik until his participation in the village fair. We think there will be a lot of actual and visual art we can play along with this. The ideas to address the theme of suicide is Life, promote life. Erik is a protagonist, but also Life is a protagonist, and the antagonist would be suicide. Q) This is a basic question, but why do those children try to kill themselves? A) According to our interviews, in the highlands of Chiapas of Mexico, it’s a gap of communications between generations. I know there are a lot of suicides going on in Japan, but the causes are different in our country. In our country, among indigenous communities, we have found a communication problem between generations and also lack of ability to express emotions and speak about problems among young people. So art would be a great tool to express and communicate emotions and to share them with others because most of the young people who commit suicide do not speak with others about their problems. Q) They’re all from indigenous community, right? So is the art they’re thinking about indigenous-oriented? A) No, that’s an interesting thing. Young people in indigenous communities use (social media such as) Facebook, WhatsApp and YouTube. So they are very much oriented in modern art, rock music and modern dance and painting, but what happens normally is using these new techniques immediately reconnects them to their roots. Q) Do they have any problems in education there? A) Yes, there is a lot of difference between quality of education in indigenous communities and in urban communities. That’s also a huge problem because after breaking up with their parents, they immediately realize in the society that they do not have many opportunities because their education level is very much lower. Also, there is still a lot of discrimination today against indigenous communities. Out of the community, young people are picked on because of their way of speaking because Spanish is their second language. So they still struggle with discrimination issues. Q) Now, we would like to talk about your career. You talked about being a producer, but you are also doing news reporting. So how did you start your journalistic career and production work? A) It’s very interesting. My background was an NGO work, and when I came to Mexico in 1995, we started with a children-youth project, art workshops. Then we moved to a puppet creating company, then we came to TV ten years ago. So first, we used to produce fiction series, and little by little we moved to non-fictions because we realized that there was very little TV production about little children who are being hurt. So that’s why more and more we started to produce non-fiction series, and we have been doing a newscast for children for two years now. Q) So you started the TV production work in the current organization? A) Yeah, TV production 10 years ago in 2008. Good anniversary with Japan Prize. Q) Also, I would like to ask you about the broadcast situations in Mexico. How many TV Stations, radio stations, cable or satellite are there? A) We have a national network of public broadcaster, so almost every state in Mexico has a public TV station. And we have 3 nationwide channels, Canal Once (which is) Channel 11, Channel 22, and one is called SPR, a new one. We have some competitive commercial TV channels as well. Also, we have educational TV production for children and youth that’s in a kind of crisis at this moment in Mexico. We haven’t had much development during the last 6 years. Now we have had a government change in Mexico, and we hope the situation will improve and get better because there was a decline in production for children and youth. Q) How are you going to spread your program to the people? A) There are two ways. First of all, of course, broadcast nationwide through Channel 22. I hope they will accept our product, and to the national network of TV station, so I’ll try to spread it throughout Mexico. But in a specific community of San Andrés Larráinzar, we need to distribute via WhatsApp video, Facebook and YouTube, and we need to have public events to show the documentary to the community and also speak with the government and authorities. That’s the plan. We have a different plan for this specific community and a different plan for nationwide distribution. Q) When are you going to start this project with Erik? A) We are starting in January, but of course we have to come back and we have to plan and prepare. Q) All right. So I’ll see you next year. Good luck.